Marvel’s most risky, most out-there, and easily among the most entertaining of entries in their ever-spreading series of Avengers-related crossovers, Guardians of the Galaxy is unique among such superhero fare in that it’s not about a caped or iron-armored crusader saving the day. Rather, this comedy-infused space adventure has more in common with segments of Star Wars (or more accurately The Avengers helmer Joss Whedon’s Firefly television series and subsequent film Serenity), in that it follows a lovable gang of space cowboys and scoundrels on a mission to save the galaxy. Moreover, unlike other Marvel superheroes, the Guardians of the Galaxy characters haven’t been a consistent staple in the comic book universe, and therefore they’re not floated by the widespread name-brand recognition that accompanies the studio’s better-known figureheads. As a result, Marvel tests their own range and their connection to the moviegoing public with the film and, given the hugely entertaining outcome, before long the Guardians of the Galaxy will be every bit a household name as Captain America or the Incredible Hulk. Introduced in a 1969 issue of Marvel Super-Heroes by creators Arnold Drake and Gene Colan, the Guardians of the Galaxy team has never had a consistent run in the comics and stands as an obscure presence in the Marvel Universe. In each incarnation, they consist of an interspecies band of cosmic rogues who ultimately become do-gooders. In 2008, Dan Abnett and Andy Lanning rethought the concept and characters for a new comic series, and first-time screenwriter Nicole Perlman based her screen story on Abnett and Lanning’s updated versions. When Marvel hired James Gunn to direct the feature adaptation, Gunn put his own spin on the material and rewrote the script. But Gunn’s inclusion represents yet another risky decision on Marvel’s part given his background with Troma Entertainment, his script for the Dawn of the Dead remake, his horror-comedy Slither, and the darkly comic homemade hero yarn Super. 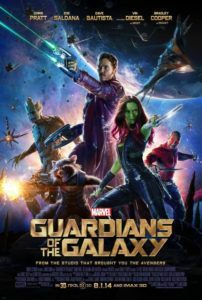 Appropriately, Gunn and Perlman’s final script plays like a B-movie version of The Avengers (tonally anyway, the reported $170 million budget renders everything onscreen with blockbuster sheen), its plot machinations quite similar to Whedon’s blockbuster, but its devil-may-care attitude and idiosyncratic humor are all its own. In a 1988 prologue, Earth boy Peter Quill finds himself abducted by aliens just after the teary death of his mother. When we meet Quill again 26 years later (now played by Chris Pratt), he’s renamed himself “Star-Lord” and become one of a number of intergalactic bandits known as Ravagers, led by blue-skinned hillbilly scalawag Yondu (Michael Rooker). Yondu has tasked Quill with recovering a mysterious silver orb from a cavern on a dead planet, and when Quill arrives to seek it out, “Come and Get Your Love” by Redbone blasts on his Walkman from a mom-made mixed tape of 1970s hits, carefully preserved since his childhood like a security blanket. Quill starts dancing about like the overconfident doofus he is, and the sequence moves into a riff on the opening of Raiders of the Lost Ark, a reference that establishes Quill as a child who grew up during the heyday of 1980s pop culture. As Quill secures the orb, he must evade a squad of baddies sent by Ronan the Accuser (Lee Pace), an aggressor of the Kree race. Ronan has promised the orb to his overlord Thanos (Josh Brolin), who has promised Ronan that, in exchange, he will destroy the Earth-like planet Xandar, home of the Nova Corps fleet commanded by Nova Prime (Glenn Close). When Quill escapes Ronan’s goons and betrays Yondu to collect the orb’s profits for himself, Ronan orders Thanos’ adopted daughter, an assassin of green skin named Gamora (Zoe Saldana, much versed in sci-fi after Avatar and Star Trek), to hunt Quill down. Also after Quill for an outstanding bounty are super-intelligent raccoon Rocket (voiced by Bradley Cooper) and his ent-like sidekick Groot (voiced by Vin Diesel, whose readings consist of tonal variations on the line “I am Groot”). They all clash on Xandar, and for their very public skirmish end up in jail alongside fellow convict Drax (Dave Bautista), who’s bent on exacting deathly vengeance on Ronan. After making a pact to sell the orb and split the profits, the ever-bickering fivesome (Quill, Gamora, Rocket, Groot, and Drax) bands together for a bravado jailbreak. 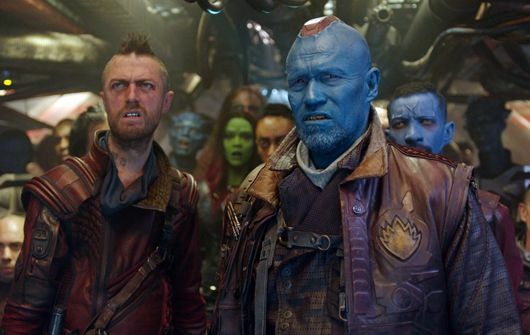 With both Yondu and Ronan, accompanied by another of Thanos’ adopted daughters Nebula (Karen Gillan) on their tail, they make their way to sell the orb to flamboyant hoarder The Collector (Benicio Del Toro), but soon realize that greater stakes are at play beyond lining their own pockets. Central to the ongoing delight of the film are the larger-than-life personalities and how, together, they replicate the infighting and squabbles that made The Avengers so interesting, only in a more rough-and-tumble approach. Pratt is an unlikely figure for a square-jawed space jockey, but he buffed up for the role and occupies a kind of goofball, self-aggrandizing version of Han Solo, complete with moments of charmingly incorrigible self-regard. Being the only Earthling around, Quill is isolated, desperately heroic, even sort of tragic, and he makes persistent jokes and pop-culture references that no one around him understands. His good-humored rapscallion ways break through Gamora’s tough outer shell, and soon she’s making hilarious Kevin-Bacon-in-Footloose references without really understanding what they mean. But stealing the show is Rocket, an unscrupulous and embittered victim of genetic experiments whose existential challenges, morbid practical jokery, and comical amorality are softened by Groot’s gentle giant, puppydog-eyes routine. Both characters are computer-generated and flawlessly integrated into their CGI surroundings with other actors. Most unexpected is the humor surrounding Drax, a bruiser who uses exclamations like “Behold!” in all seriousness and lacks the ability to understand metaphors. Since these heroes aren’t firmly established in comic lore, Gunn and Perlman are free to explore an open-ended universe of various alien races, advanced gadgetry, and an ever-changing set of rules. Inventing as they go, the writers have packed so much material into the proceedings that every moment offers some new type of stimuli, all without an oppressive need to over-explain the overreaching mythology, and all realized with pristine technical acumen by production designer Charles Wood and shot by cinematographer Ben Davis. There’s a wonderful momentum that inundates the viewer in the form of exciting spaceship dogfights, alien brawls, and wild sci-fi ideas (a most interesting one: the leftover head of a colossal space entity becomes host to an unruly mining colony called Knowhere). It’s all presented in an instantly understandable and relatable way, and pointedly human to boot. 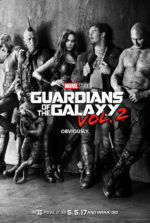 Case in point: Rather than any kind of orchestral theme, the film relies on the mixed tape in Quill’s Walkman; everything from The Runaways’ “Cherry Bomb” to David Bowie’s “Moonage Daydream” make Guardians of the Galaxy seem like it’s set in Quill’s head, the music blaring from his headphones. When the other, more serious characters join in the head-bobbing, the joy is contagious. Those unfamiliar with the Guardians of the Galaxy characters will at least recognize references to the Infinity Stones, the MacGuffins much sought after by Avengers supervillains. And though Guardians of the Galaxy may not be a pure superhero film, it establishes the groundwork for Thanos to gather all six stones, building to an eventual Avengers sequel based on the now-legend “Infinity Gauntlet” storyline from the comics (hinted at since the Tesseract first appeared in Captain America: The First Avenger). 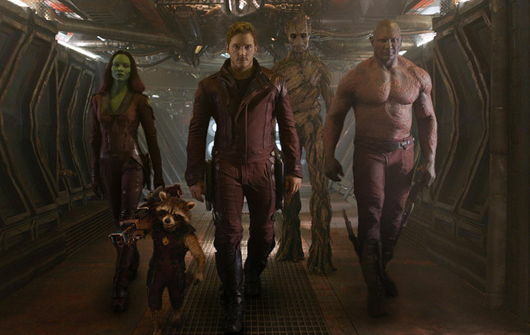 Regardless, the comedic space opera that is Guardians of the Galaxy stands alone without any prior knowledge of the Marvel Universe and, considering Guardians of the Galaxy 2 was already confirmed for 2017 before this film’s release, there’s a capacity to allow this franchise to continue independently of its E arth- and superhero-bound brethren. And this critic could hardly be more enthused. 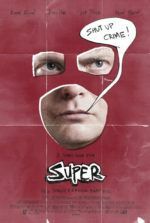 Though the story can be knowingly derivative if not overly referential, the entire production is top-notch, and pairing that quality with the film’s downright bizarro setup and expertly fast-paced delivery, Marvel and Gunn should be proud of how unusual yet accessible a film they’ve made. Well-drawn characters and strange, fascinating sci-fi ideas combine into a film that has every possibility of being Marvel’s very own Star Wars, and proves every bit as entertaining.